Okay, no real war or battle or anything. 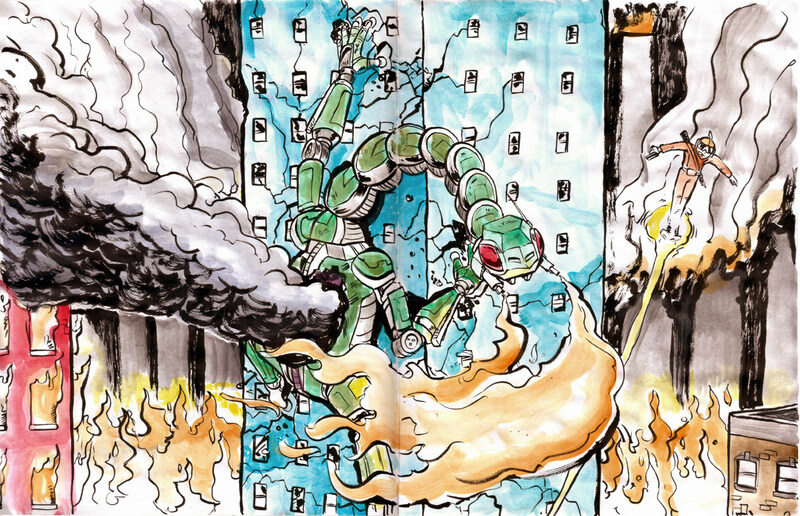 Just some scans from the ol' black book. Full spreads actually. Click to see full detail. Enjoy! and Comment! As a dying wish, Harold Fine gained the power to be young anytime he wanted, thereby staving off death. Using his new-found power he developed a special set of rocket boots and an alter-ego known to the world as Captain Geriatric. His secret identity is old Harold Fine, but nobody suspects a thing. 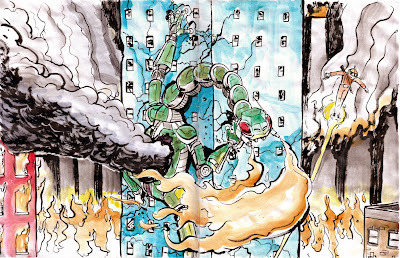 Here he is battling a Dozer, a large battle-tank that can climb and cling to walls and has a long, serpentine-like neck. It's main weapon is the dual flame-throwers in the front, and thick skin of armor. It sets the city ablaze as it battles the Cap'n. Will he be able to stop this monstrosity? Heh, made all that up on the spot. The last week of so I've been walking around the neighborhood around 7pm, when the temperature is tolerable, and I find myself stopping and resting at this now-abandoned church at the corner of Dismuke and I-45; the Epworth Parker Methodist church sits lonely and for sale. 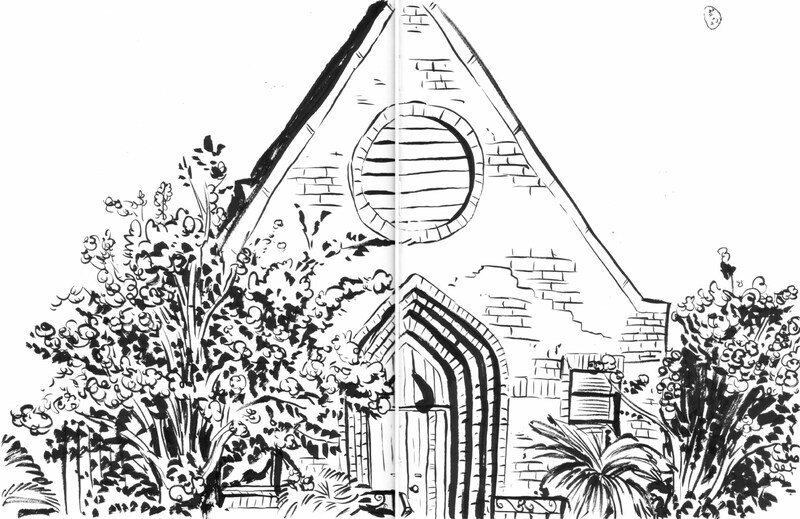 I sat and drew the facade of the parish hall, as I sat on the steps of the main chapel. 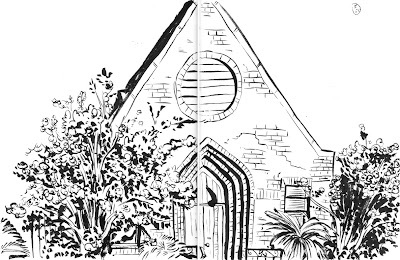 Forgive the split in the center, it's scanned right out my book. For both pieces I used a refillable Pentel Japanese calligraphy pen, and the former I colored with gouache. Jet-settin' off to Seattle with my girl tomorrow for a week, I'll let you know how that goes. As always follow me on Twitta for daily updates, links, pics, and snippets.